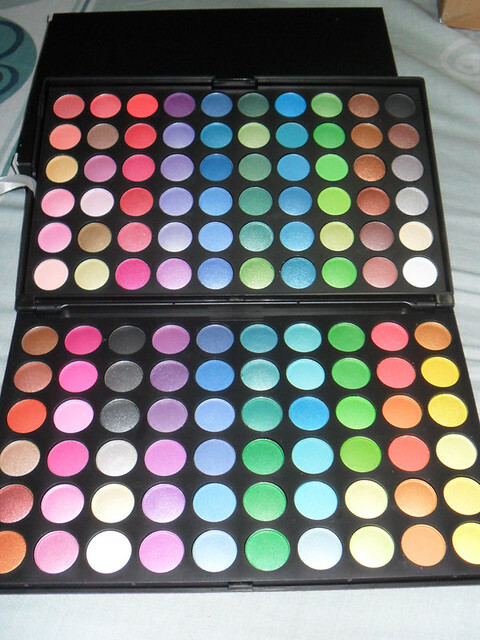 My 120 palette just came in the post today. 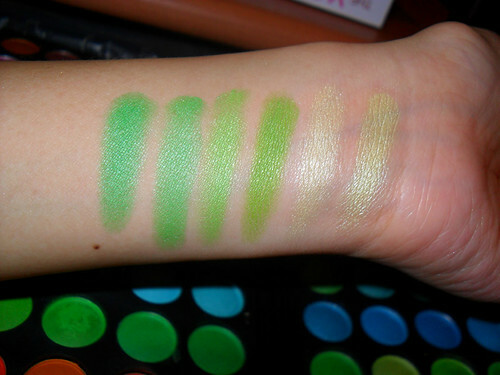 There are a handful of matte shades which have pretty much no color payoff, and start to “fossilize” the moment you rub them with a finger, but luckily they were mostly lime green and nothing I would wear out. 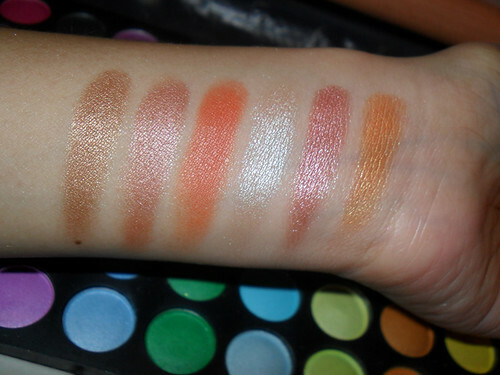 The other con is that there are a few shades which look pretty much like dupes of each other, so I’m not sure you can say there are 120 shades. 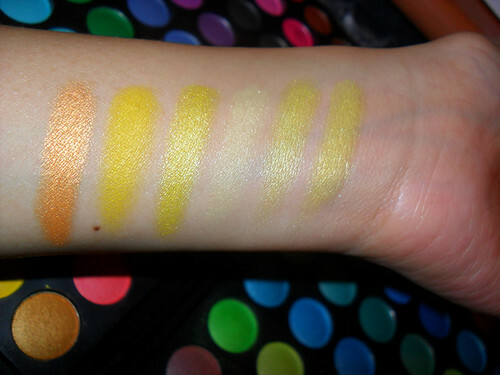 Below are swatches of 1 of the 2 pans encased within. 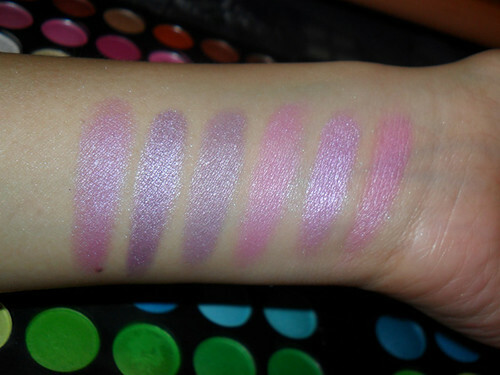 Do note that the flash makes some deep colors much lighter than they appear in real life. Row 1 - The bright amber on the left is gorgeous. The matte canary beside it takes some work to build up, but not much more than you would with MAC’s version. Row 2 - Oranges and corals. The corals have fantastic payoff. 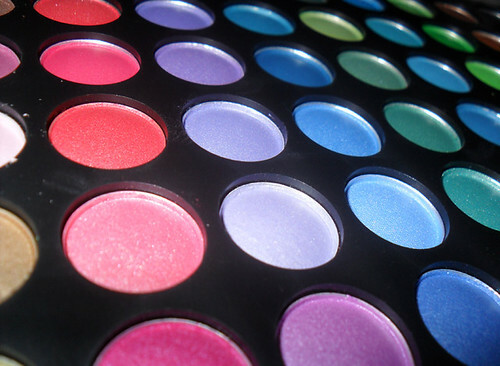 They are actually velvet/matte in real life, but apply great. Row 3 - the most problematic. You can see on the lime pan below my arm how the shadow has hardened to something like “tailor’s chalk” with rubbing. I had to scrape with a spatula to get color. But the rest, being satin/shimmer ones, were great. Row 4 - Turquoise. A whole row of Tiffany Blues. Pretty. 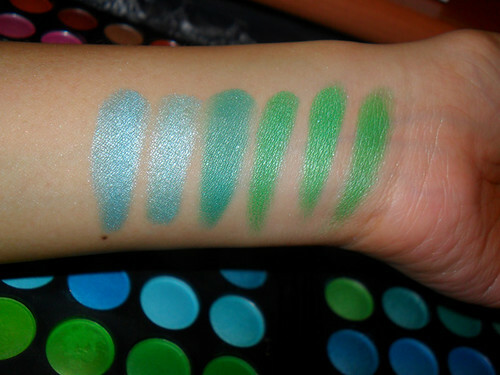 Row 5 - Aquamarines and deeper greens. One of the best rows in terms of quality. 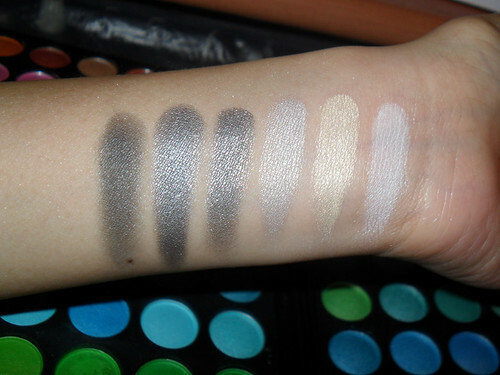 These shades look deeper in real life and can give a colorful smoky look. Row 6 - True Blues. 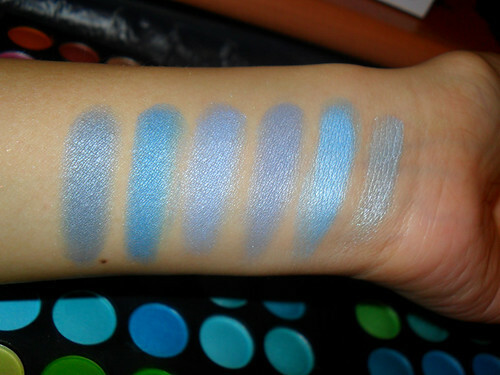 The ones of the left are deeper, almost close to navy, but the shimmer picks up the light. The couple of indigos (blue-purples) in the center are lovely as well. Row 7 - Mauves/Lilacs. These speak for themselves. Another lovely row, although I am not sure I would wear the right-most colors. Pearl pink is a little too 80’s for me. Row 8 - Great greys to ivories to whites. The dud is the black on the far-left. Yes. That was supposed to be black. 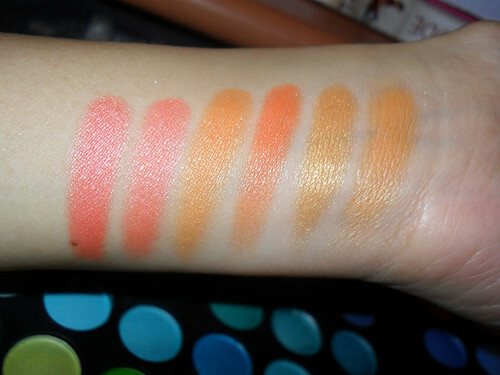 And I had to swatch it several times just to get that color. Now you know what I mean. Row 9 - The Barbie row! Lurrrrv. 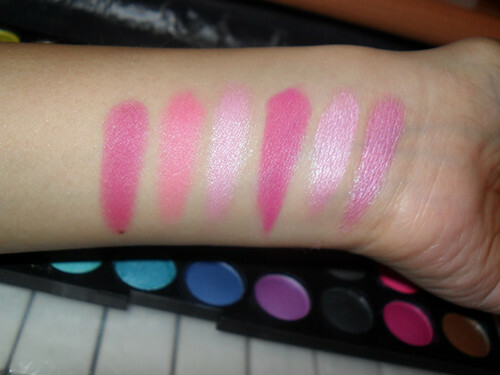 I am not one to wear pink anywhere near my eyes, but the magenta, fuschia and matte neon pink is SOOOO gorgeous I might just pull a Nicki Minaj with them. Row 10, my favorite. Some very outstanding multi-faceted terracottas, browns, and one odd pumpkin which is similar to a shade I’d been lemming at Make Up Store. 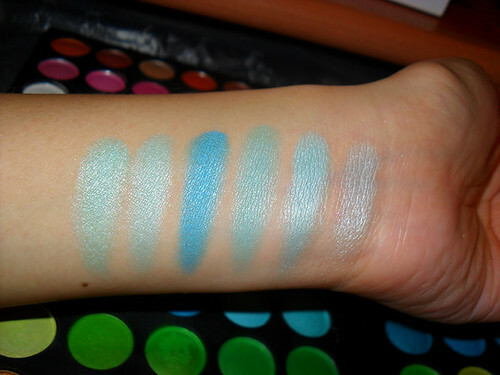 This row would be fun if you have cool-colored eyes (grey, green, blue, violet). 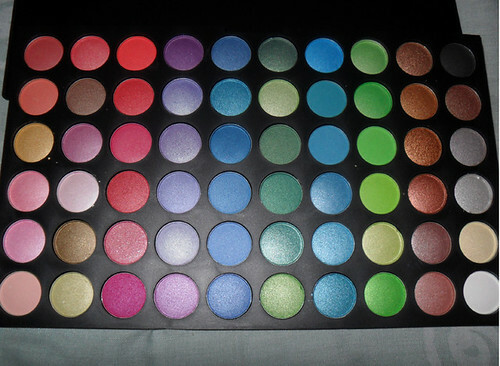 Go to part 2 and a mini-review of the 120 palette here.